How to take care of your beard. Beard care has always been a big subject in the barbershop. Here’s our quick guide to help you. All of the products recommended below are available in our shop and also in our online shop. Now there’s a surprise. Listen up. Brushing and or combing your beard really does help. It stimulates the blood flow to the beard follicles and encourages healthy growth, it also distributes the natural oils along the hair shaft. This will improve the condition. My advice would be to brush beard, apply beard balm or oil, then brush again. By applying oil or balm first, it will reduce friction, prevent pulling and minimise hair breakage. I recommend investing in a Kent beard brush and a moustache comb. (Kent was established in 1777 and carries the Royal warrant, and are makers of specialist products perfect for grooming and maintaining facial hair). This perhaps is the most vital of points for beard care, please do not dismiss this information. Beards should be washed regularly, it is important to remember that the hair on your head is very different to the hair on your chin. Regular shampoo contains chemicals which strip the natural oils from your scalp and hair. Using regular shampoo on your face fuzz will ultimately leave it looking like a well-used Brillo pad – trust me, it aint a good look. A Specialist beard shampoo is what’s needed. They are free from harsh chemicals. We like Captain Morgan’s Beard Wash. it’s a crackin’ product, British and represents excellent value. As the seasons turn, temperatures drop and the central heating comes on you may experience dryness and possibly (cue sharp intake of breath) dreaded ‘beard-ruff’. Be warned, beard-ruff can strike at any time if you fail to pay due attention to the skin underneath. As part of a complete grooming regime you should be using an exfoliating cleanser to regularly remove the dead skin from beneath the beard. In addition to this, I would suggest an electronic facial cleansing brush (such as the Remington Recharge) which will not only cleanse and exfoliate your skin but at the same time soften your stubble. “It is important to remember to keep both your beard and the skin beneath it hydrated. To moisturise your beard, consider investing in a good beard balm. This will give you minimal hold and control wayward hairs. 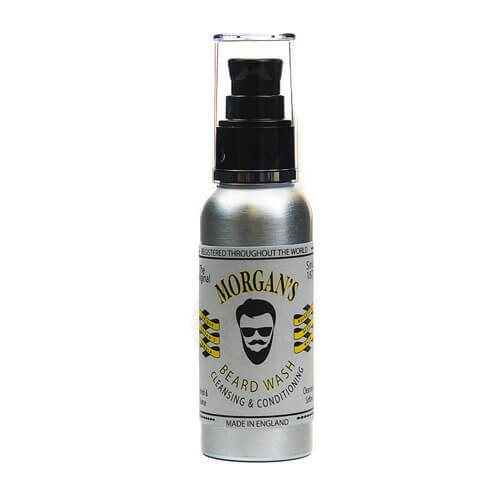 We prefer the Morgans Beard Balm, especially on short beards. When beards are longer we recommend you switch to an oil such as Captain Fawcetts Booze & Baccy. Oils and balms will leave your beard feeling soft, smooth and perfectly groomed. You should also continue to apply your normal daily moisturiser directly to the skin beneath your beard, leaving as little residue behind as possible. Its best to use something light. Our preference is MenU moisturising lotion.